Our Stinger Non-fused Distribution Blocks are perfect for adding a 2nd, 3rd or 4th amplifier! We have them available in a large variety of inputs / outputs and multiple gauge wires from 1/0 to 8 Gauge. 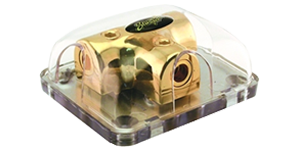 Our Stinger blocks come in both platinum and gold finish to match any installation.